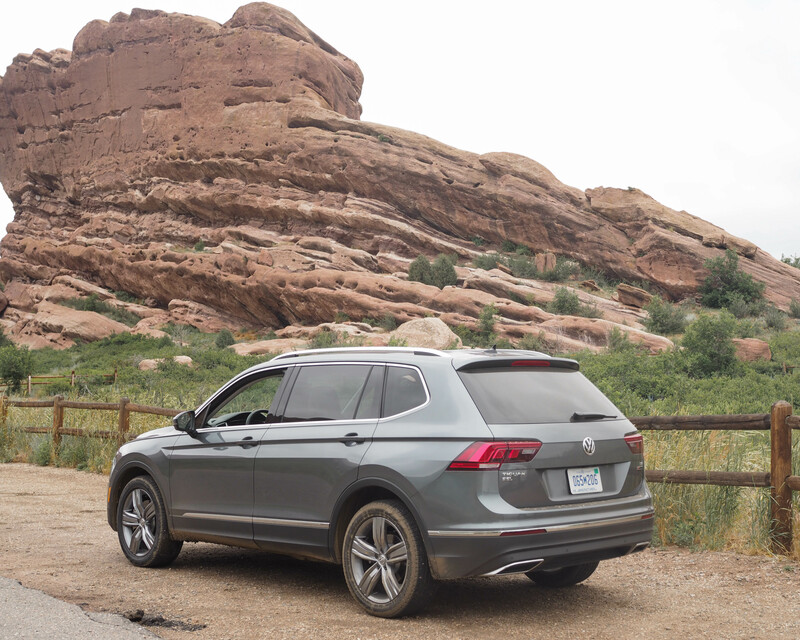 I flew out to Denver Thursday afternoon for a quick 24-hour trip with Volkswagen. They sent me to Seattle last fall, so I knew this was going to be another fun-filled adventure! This was my first time going to Colorado and I couldn’t wait to check out all the amazing mountain views that I’d heard so much about. There really is so much beauty right here in the U.S. I think sometimes I forget that, so it’s always a great experience to explore new cities. 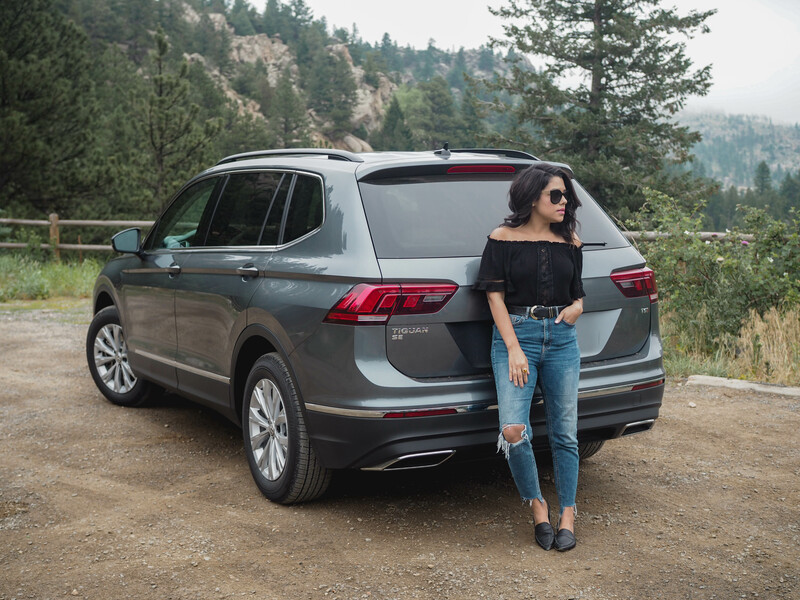 The purpose of this press trip was to be introduced to and test drive the new 2018 Volkswagen Tiguan. You guys, driving around in these cars is seriously a dream for me since I’m still whipping around a 2003! Everything is so hi-tech now and it’s incredible to see what cars can do today. It was a 24-hour whirlwind! 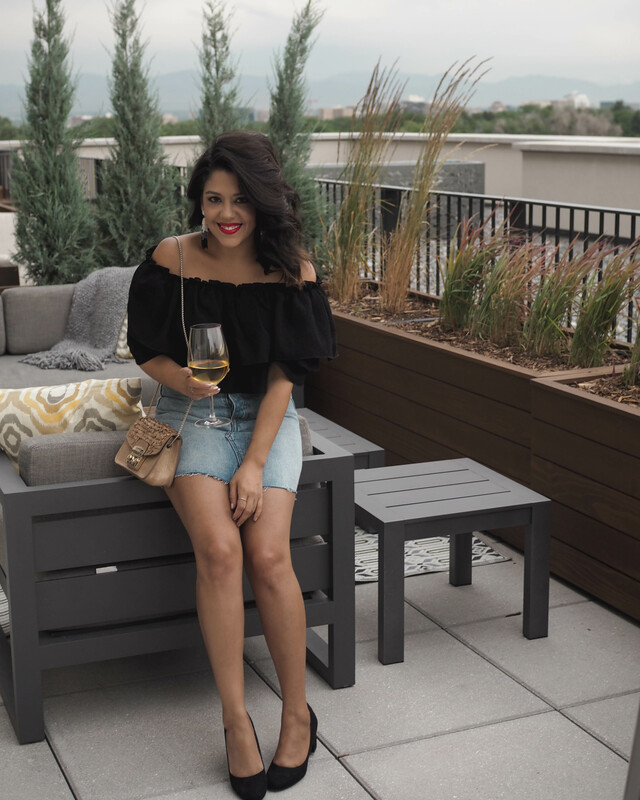 As soon as I landed and checked into the hotel – Halcyon Hotel in Cherry Creek – I got ready for the welcome reception and dinner on the rooftop with the whole VW team. Hopefully you got to see this part on my insta-stories. The rooftop was so cute and we saw the most incredible sunset from it. I got to reunite with my girls Abbey and Ria and met some new people too. That’s always one of my favorite parts about these trips. I love meeting everyone. Volkswagen always knows how to put together such a versatile group of people from bloggers to editors to reviewers. They also know how to put together the best food spreads too. I think I ate the most amazing sea bass of my life and their cheese platters never disappoint. So happy I only had to pack a carry-on for this trip. I stuck to a black off-the-shoulder top & denim theme to make it simple and easy. The next morning, bright and early, VW did a whole presentation of the 2018 Tiguan during breakfast. After giving us the 411 on all the details, it was time to hit the open road and check it out for ourselves. I teamed up with Abbey and Ria again. We took turns driving both the SE and the SEL. I preferred the SEL! They had several different routes mapped out for us so that we could pass through different parts of Colorado, like Boulder & Morrison, while driving. I couldn’t get over the views! We literally drove these bad boys all the way up and down the mountains and the Tiguan did not disappoint. I have to admit I was a bit nervous because the fog up there was NO joke and the roads are constantly winding around. Once we made it to the top we took a pit stop at this cute little lodge for coffee and snacks. This was such a great way to really test the limits with the Tiguan. 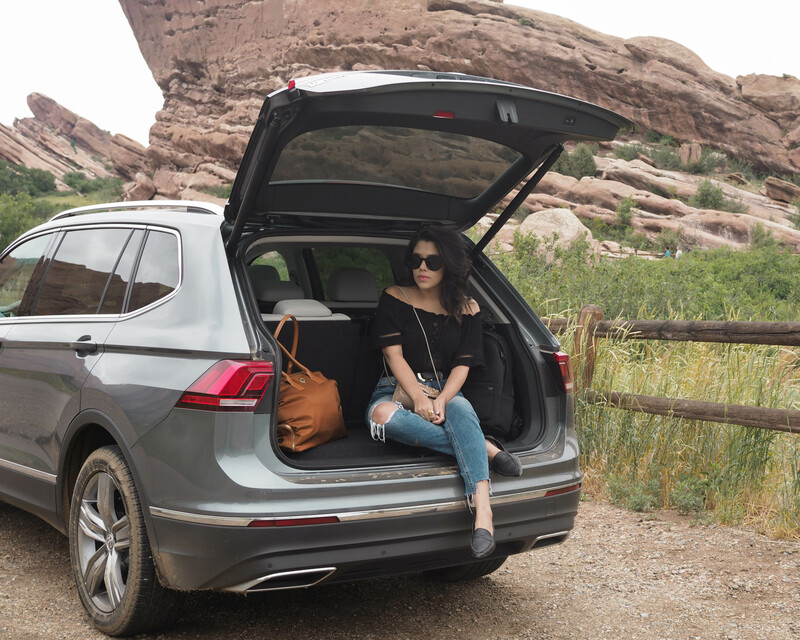 It has amazing traction and it’s the perfect SUV for those outdoor adventures and road trips with family or friends. There’s plenty of space, including a third row if you need it. Some really cool & helpful safety features are the forward collision warning, blind spot monitor, rear traffic alert with breaking, automatic crash notification and emergency call. These are features that I seriously wish my 03 had. The Tiguan has enhanced navigation (which totally saved us), a panoramic sunroof and you can run apps from your smartphone directly on the car’s display. This definitely came in handy too. One thing that I did have to get used to was the start/stop system. The next route took us on another scenic tour until we made it to our lunch spot. It was at this cute place called Beso de Arte. 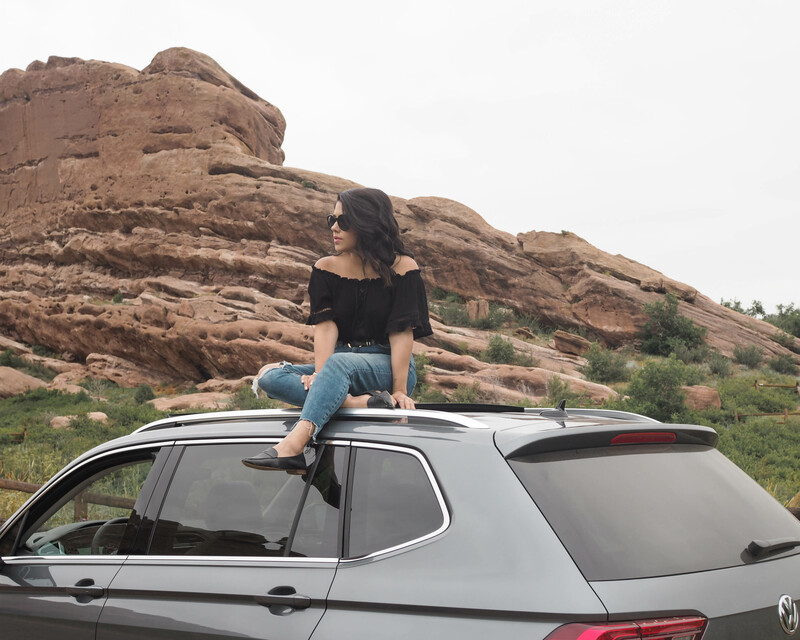 After that we hit up Red Rocks Park & Amphitheater to take some more photos with the car, which of course meant sitting on the roof and in the trunk. 💁🏻 The three of us were hoping to recreate the photo we took in Seattle, but unfortunately this time we didn’t have anyone else with us to take the shot. I wish that I would have had a little more time to explore Red Rocks. I definitely didn’t get to see it all, but I got a good taste of it. It made the perfect back drop! If you ever visit Colorado, please make sure to check it out. It’s a must-see for sure. After that, it was time to head back to the hotel and get ready for the airport. 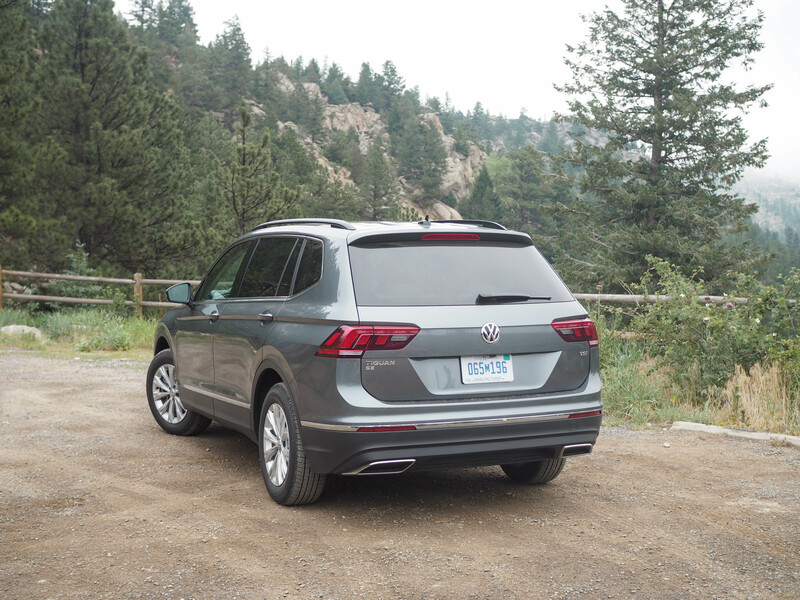 In just a short 24 hours, I still felt like I got to see a lot of the beauty that Colorado has to offer and of course riding around in the Tiguan made the experience that much more enjoyable. This little getaway gave me some new insight and inspiration. Trips like this always give me the opportunity to create a different kind of content and I love that so much. It’s seriously exactly what I needed to get my creative juices flowing again. A huge thank you to Volkswagen for hosting me on this trip and I hope to do another getaway soon! Thanks everyone for checking out the post and hope you enjoyed it. Happy Monday loves! You look so cute and that car looks amazing!! 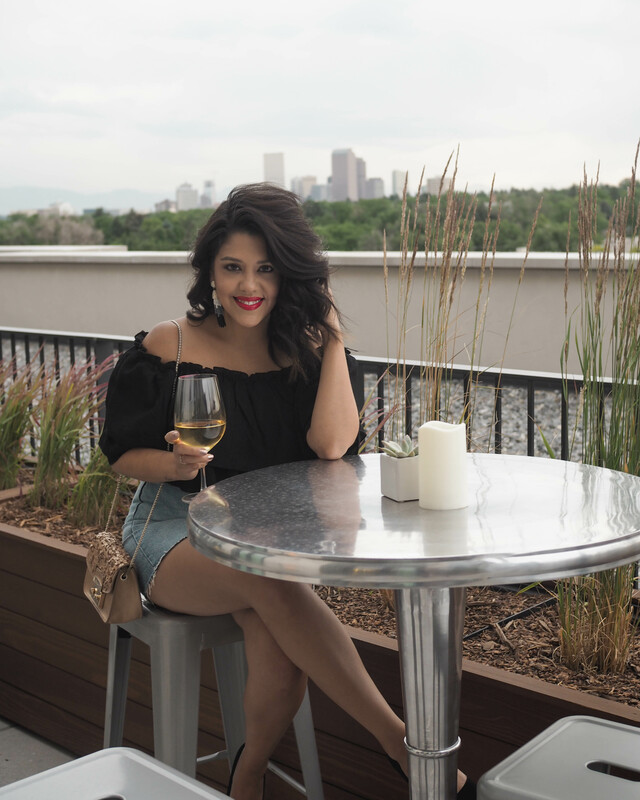 I’ve only been to Denver once for a brief time and I’d love to go again for longer! As a VW owner I know exactly what you mean! I love VW’s – but have never driven a Tiguan, love the style. As a mom of 2, I am all about safety and making my life easier! We need a new car so this is definitely and option.